Rodney and Heather have supplied us with a fascinating report on their newly found fondness for dormice and the steps they are taking to encourage them to flourish in their wood. Rodney and I have had a really interesting time this year monitoring the dormice in our wood whilst training to obtain our handling licence. We need this because they are a protected species and so we have been ‘shadowing’ two licenced recorders since April. That month 50 nest boxes were attached to trees at chest height around the wood and once a month since, the four of us have spent a couple of hours inspecting the contents. On forms supplied by the People’s Trust for Endangered Species, we have noted whether there was a nest and if so whether it was a neatly woven ball of honeysuckle bark, grass and leaves made by a dormouse or a loose layer of assorted leaves dragged in by a wood mouse. 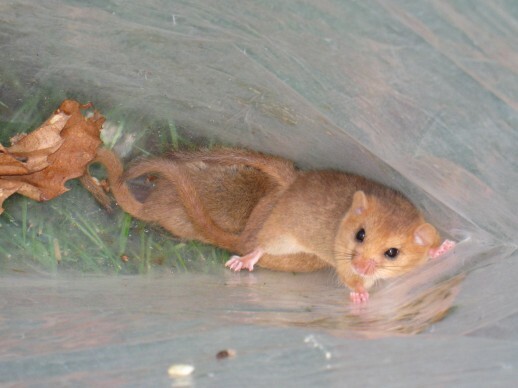 If we have been lucky enough to find a dormouse or even dormice in residence then the animals have been sexed, weighed and approximately aged before put back in their home. Over the season we have been really thrilled to see nests containing pink babies with their mother, lively juveniles with their parents, pairs of young adults and single adult males snoozing contentedly. 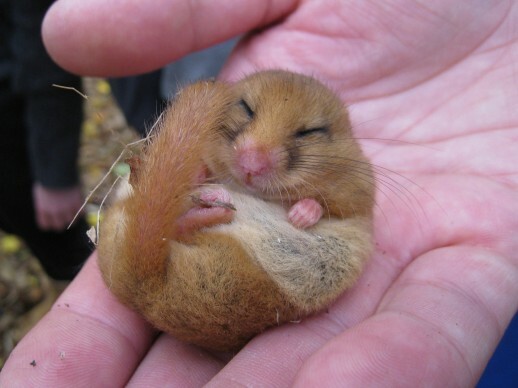 We had been given the impression that because dormice are nocturnal, any found during the day are likely to be very sleepy or even torpid if the air temperature is cool. For some reason ours are extremely lively and on several occasions have leapt out of the nest box and run up the tree at the sound of approaching footsteps. In both July and August we recorded a total of 16 animals, 18 in September, and on the 1st November we found 20 – really good totals for a 14 acre wood with boxes only installed in two thirds of the area. 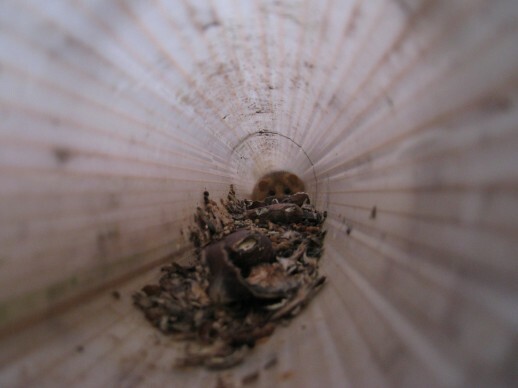 Any dormice found this month weighing less than 12 grams will not survive hibernation so Rodney designed feeding tubes that he put up in trees closest to the nest boxes containing the youngest animals. We filled them with sweet chestnuts picked up from the woodland floor and as you can see from one of the photos they have certainly been appreciated!